Raising chickens can be a rewarding experience. Aside from the eggs and meat chickens produce, they can also have other uses in our yard and garden. Here’s Part 1 of our look into a valuable, beloved part of the abundant organic farm..
First, think about your needs. 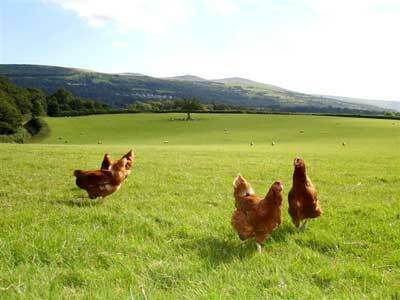 Are you raising chickens for meat or eggs exclusively, or would you like a breed that is a good cross between both? Are you going to breed your chickens, or are you going to leave a rooster out of it completely? There are lot of breeds out there and each is unique. Good egg producers include Araucana (they lay blue eggs), the Campine, and the Welsummer. If you want large birds bred for their meat, try Jersey Giants, the Bresse and the Cornish-Rock. 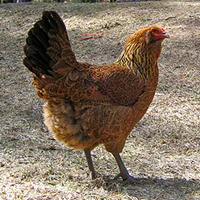 Chickens that offer a good mix between egg production and meat production are the Barred Plymouth Rock, the Rhode Island Red and the Austrolorp. There are many, many breeds out there. These breeds may not be available where you are. If you have questions, you can always chat up someone with livestock, or the crowd at the feed store. They always have opinions. When it comes time to buy, make sure you select birds with alert eyes, little to no mites in their feathers and a clean vent (the single excretory orifice behind the tail). Birds can usually be found through your local farm supply store. Go with small, local farms, as you’ll find a better variety of birds that are usually healthier. Male chickens, obviously, don’t lay eggs. They also reach sexual maturity in a little under a year. Once this happens, they will try to breed with your hens, crow constantly and become territorial and aggressive. While these things are a pain to deal with, a good rooster will produce many offspring and provide protection for your flock. More than one rooster per flock doesn’t work that well, however. They fight and, while they do eventually establish a pecking order, the potential for injuring one another and general annoyance is high. This is why yearling roosters (cockerels) usually end up in the oven. Chickens require a place to perch at night, when they sleep. They also need a confined area to move around in, during the day. The more they can hunt, peck and scratch in their run, the better, as this keeps them from becoming listless. Hens will lay eggs, so they need a dark, closely-confined box with bedding to make a nest of that they can get to when they need it. Laying boxes are usually built into one side of the coop. Hatches and doors are built onto the outside, so that you can collect eggs from the outside of the coop. Coops and runs need to be secure from predators. This is extremely important. Make sure that your coop and run are structurally sound and any boards, chicken-wire, doors or latches can’t be pried open by opportunistic nocturnal species, or you may wake up to an ugly scene of dead chickens in the morning. It may not be a bad idea to bury some reinforced wire or old concrete pieces a foot or so beneath the edges of your coop and run, to deter animals that can dig. Chicken coops need elevated, horizontal bars or planks that chickens roost on at night. Chickens naturally go to bed around dusk, so there needs to be an opening that they can access at around this time. Having a mesh of chicken-wire below the roosting area will collect night-time chicken-waste. Having access to this part of the coop is important, too. Chicken manure should be cleaned out of the coop regularly. Having a roomy run improves chicken’s quality of life. Chickens would love to get out and hunt during the day, so if you have an enclosed garden, this could be an option for you. Be warned, chickens will tear up a garden, eat seedlings and greens, dig up seeds, peck holes in vegetables, kick mulch around and generally create small-scale havoc, if you’re not careful. Confined to one area, they will quickly kill vegetation and leave a brown, dusty patch. They also leave their manure, which is extremely nitrogen rich. Having movable fencing may be one option to shuttle your chickens around, although they can fly over a fence as tall as 1.5 meters. If you have your chickens in a run, giving the chickens something to tear apart, like a small bale of hay, will keep them occupied. Chickens should have daily access to fresh food and water. Chickens will eat chicken feed primarily, something you can get at your local feed store. Make sure to buy feed that is specifically for the type of chicken you are raising: layers (eggs), broilers (meat), or chicks. Chickens also need grit, small minerals that aid digestion. Layers should get a supplement of oyster shells, to strengthen their eggshells. Chickens also love kitchen scraps. Avoid giving them aliums or citrus, which will impart their flavors on the eggs. Also, be sure to clean up any old, excess scraps, to keep your run clean and avoid attracting pests. Durable metal automatic feeders and watering cans are a great investment. They have handles and can be easily retrieved and cleaned as necessary. Feeding chickens is often an imprecise science, but an adult chicken will eat anywhere from 115 to 200 grams of food a day. If you use an automatic feeder, they’ll always have access to food. They’ll always go crazy for scraps, acting like they’re starving. Chickens should never be left without water. Always make sure they have fresh water. This is just a look at the basics. Next time, we’ll cover raising chicks and collecting eggs!